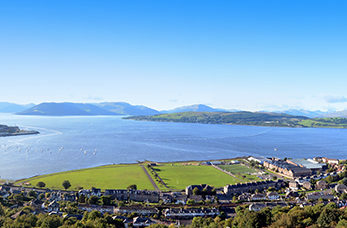 Greenock is a historic industrial town situated 25 miles from Glasgow. It still retains its impressive Victorian buildings including the 245 foot Victorian Tower. Glasgow is the cultural capital of the Lowlands, lying on the banks of the River Clyde it has unique masterpieces by the legendary architect and designer Charles Rennie Mackintosh. Explore the stunning landscape of this popular leisure destination which features the largest freshwater loch in Scotland and has more than 30 islands. Glasgow Cathedral is the only medieval cathedral to survive the Protestant Reformation of 1560 intact. Today it's home to one of the finest post-war collections of stained glass windows to be found in Britain. The romantic Inveraray Castle & Gardens is located on the shores of Loch Fyne. This 18th century castle is home to a stunning collection of family portraits and English china. Take a stroll through the beautifully maintained garden and marvel at the surrounding highland scenery. Visit the Transport Museum where you can find the oldest surviving pedal cycle and other forms of transport from horse-drawn vehicles to fire engines, from motorcycles to caravans and over 250 fascinating ship models including the Queen Mary, Queen Elizabeth and Queen Elizabeth 2.